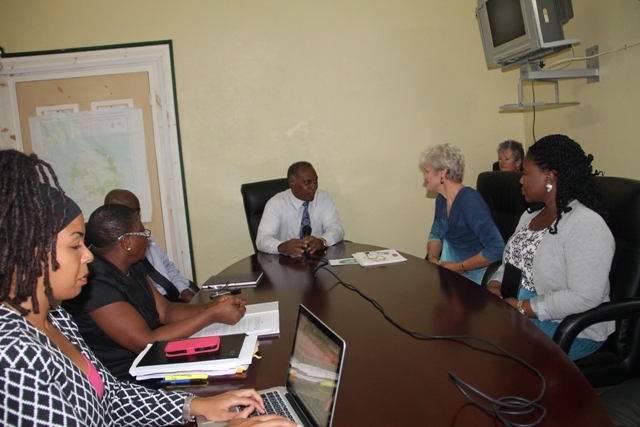 NIA CHARLESTOWN NEVIS (AUGUST 26, 2015) — Premier of Nevis and Minister of Education Hon. 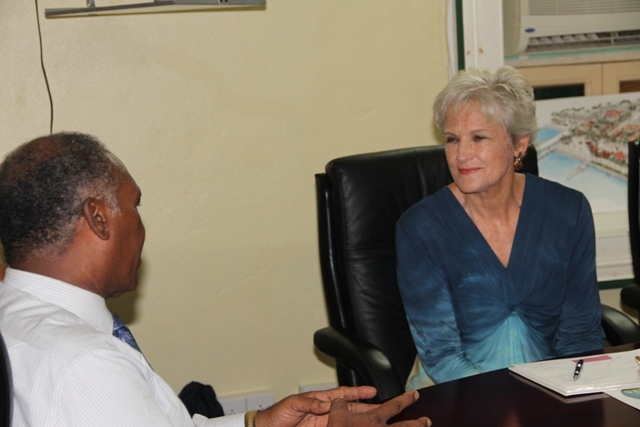 Vance Amory met with California based two-time Olympian Marilyn King at the Nevis Island Administration (NIA) conference room at Bath Hotel on August 25, 2015, to discuss her “Olympian Thinking” programme, training which will be offered to teachers on Nevis through the Department of Education. In brief remarks ahead of the meeting, Mr. Amory noted that any advice or strategies which would enable educators and education officials to get the children to reach their maximum potential would be of benefit to the community. “We are looking to make better communities through better people and I think the place to begin is where our children are most receptive, most malleable and that is in the schools,” he said. In response, King explained that her programme is designed to demystify exceptional human performance and to take the mystery out of what it is that allows ordinary people to do extraordinary things and to achieve at the highest level. Meantime, Principal Education Officer Palsy Wilkin explained that King had offered the Department of Education training with her programme through Skype and was on Nevis at the Department’s invitation. She said during the training for some teachers, principals and sports officers, the department recognised that it is in keeping with its Child Friendly School Initiative framework which the department had been working on for the past three years. Wilkin described the a initiative as holistic child-centred education for all. “We recognised we have not really had the buy-in that we have been looking for from our teachers, all of our stakeholders and we recognised that this type of training…was really what we were looking for in terms of our Child Friendly School Initiative. “Hence, we invited her to help us to get that buy-in that we are looking for. Particularly, we look at goal standards for our teachers. We are not satisfied that we are really operating at the level of standards that our teachers should really be operating and hence we thought that getting Marilyn King to work with us, could really enhance what we are doing and take us to where we really need to go,” she said. Also present at the meeting was Permanent Secretary in the Premier’s Ministry Wakely Daniel, Education Planner Dr. Neva Pemberton and Sports Coordinator Michelle Sutton.